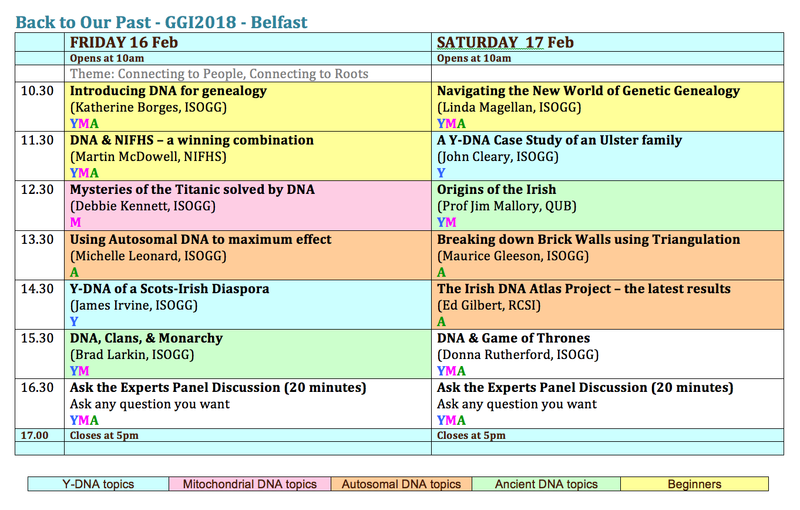 The Titanic Centre in Belfast sees the first Genetic Genealogy Ireland conference outside of Dublin. Running over Friday & Saturday 16-17 February 2018, the event forms part of Back to Our Past and includes top speakers from the world of genetic genealogy as well as leading academics. 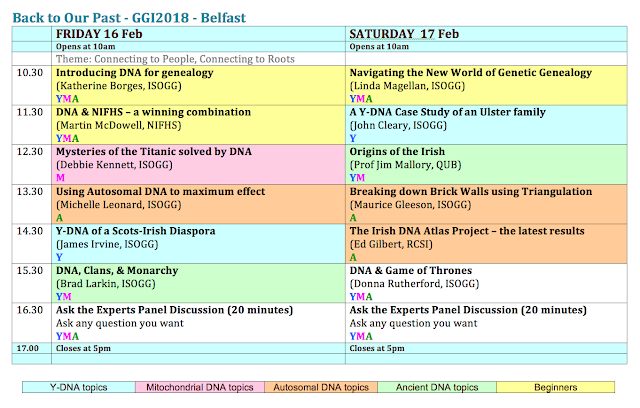 Below is the final lecture schedule for GGI2018 Belfast. For ease of reference the topics are colour-coded into various categories, including Beginners (yellow), Y-DNA (blue), mitochondrial DNA (pink), autosomal DNA (orange), and ancient DNA (green). Thus the 12 lectures cover a wide range of different subjects. As well as beginner sessions from ISOGG stalwarts Katherine Borges and Linda Magellan, Martin McDowell will discuss the role of the North of Ireland Family History Society in educating its membership about the value of DNA testing and how their 1600-member DNA Project has made such a huge impact in advancing people's individual genealogical research. John Cleary and James Irvine will discuss several surname projects of immediate relevance to the North of Ireland that illustrate what can be achieved by Y-DNA as a tool for researching surnames, their origins, and their evolution. Debbie Kennett gives a very apt presentation on how DNA was used to solve some of the mysteries of the Titanic and identify some of the victims. Michelle Leonard and I will cover autosomal DNA (the most useful of the DNA tests for routine genealogical purposes) and how it can be used to connect with cousins and break through dead ends in your research. Professor Jim Mallory from Queens University Belfast will be speaking on the origins of the people of Ireland based on the combined evidence from the fields of archaeology, linguistics, and genetics. And linked to this is the presentation by Ed Gilbert, who will be presenting the latest results of the Irish DNA Atlas project. Brad Larkin will be reviewing what DNA tells us about the British Monarchy and the Irish Clans. And Donna Rutherford will bring us on a fictitious journey into Game of Thrones (filmed beside the Titanic Centre) and what DNA testing might reveal about some of the unfortunate characters therein. Each day will end with an Ask the Experts session where anyone in the audience can ask any question at all to a panel of assembled experts. And then there is dinner, followed by the usual carousing. I hope to see you in Belfast. Thanks Maurice! Would love to go, but the timing isn't right for me. Are there any DNA genealogy opportunities in late June, all of July, or early August?